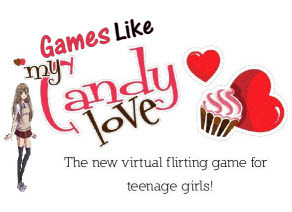 Games Like My Candy Love '+g+"
My Candy Love is a popular dating game for teenage girls where you can flirt with the boys you're interested in and experience your own true romance. If you like dating games like My Candy Love and looking for more games similar to it find the recommendations below and don't forget to tell us if we have missed any. RE: Alistair is a free game like my candy love developed and published by SakeVisual for the Windows, Mac OS and Linux.The game is primarily told in visual novel format, where the player's decisions affect the relationships she has with potential love interests in the game. It is possible to see five different endings, depending on the choices. Princess Debut is a rhythm otome game for Nintendo DS developed by Cave and published by Natsume. In Princess Debut the player play a princess in a fantasy world known as the Flower Kingdom where she must master a number of dance moves within 30 days to find a prince to be their partner for the ball. Star Project is the story of girl who becomes head of once popular star management company due to an unfortunate car accident which kills both her parents leaving the girl to takes over the company. One day, a righteous boy who shows great potential came out of nowhere and appeared before the girl. They both teamed up to start the "Star Project". Always Remember Me is a life simulation game with dating sim elements. Amy's boyfriend Aaron doesn't remember her anymore after a car accident! Will you be able to make him remember again? Or perhaps it's time to move on and fall in love with someone else? Always Remember Me lets you decide which path you want to take. Are you addicted to shopping? Do you dream of being a supermodel? Love to go on dates? Do it all and become the Top Girl! Create fabulous outfits and have fun with your new boyfriend. Kiss him, buy him gifts, and go on exciting dates! Capture and save photos of all your special moments together. Top Girl is available for your Android device, iPhone, iPad and iPod touch. Flower Shop: Winter In Fairbrook,....if you can think of more, then don't forget to mention it in comments.